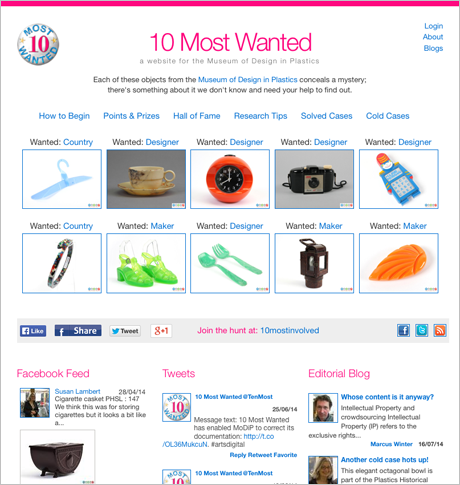 Inspired by the FBI’s Ten Most Wanted initiative, this website for the Museum of Design in Plastics combines the web, social media and gaming to motivate the public to join the search for unknown information about objects in a collection. 10 Most Wanted enables players to work together, it encourages them in physical enquiry as well as online research, helps curators to grow public interest around a collection and provides an IPR framework for integrating user-generated content into curated collections for the benefit of all. The website is built on a Drupal 7 open source framework, some considerable customisation. Technically, it has a few tricks up its sleeve. 1) The latest comments from Facebook and Twitter are all pulled into the website home page, then filtered according to topic before being displayed on the individual artefact pages. 2) Individual artefact pages have a 'Case notes' section where curators can summarise the social media discussions that lead to the discovery new information, storing the evidence trail in the website for posterity. 3) The status of an artefact can be changed by administrators from 'Open' to 'Solved' with just a single click that overlays a 'Case Closed' graphic, moves the artefact to the Solved Cases section and replaces it on the home page with a new artefact. While this project is all about plastic artefacts, the approach and methodology are equally applicable to other types of collections. 10 Most Wanted was developed in partnership with the Museum of Design in Plastics and University of Brighton and it is funded by Nesta's R&D Fund for the Arts. 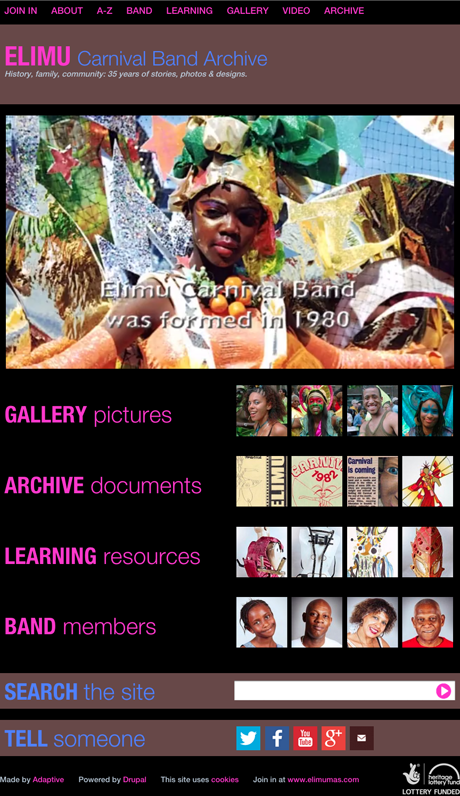 Having taken part in Notting Hill Carnival every year since 1980, the members of Elimu Carnival Band wanted to assemble and publish an archive of their activities before the records become lost in time. To do this we made a website built on the Drupal 7 open source content management system and using the Zen responsive theme. The home page invokes the spirit of carnival by playing a slideshow to a soca soundtrack in a large window the moment the page loads. It also includes large links and sample images of what visitors can find by exploring the various sections of the site. To take advantage of the dozens of colourful images of costume and dance we decided to set them against a black background and use large thumbnail images for the galleries, large enough that they have descriptive value without needing to be enlarged. The site includes galleries containing hundreds of images of the band performing carnival through the years, as well as pictures today's band members in street clothes, and an archive of documents, press cuttings and artefacts. Registered visitors to the site can add their own comments to the images, sharing their thoughts and recollections about the experience of carnival. The galleries use tagging to group some of the images together by subject or by date, a system that should be easy to maintain and the extend by Elimu's editors into the future. The Elimu Archive website is a part of a project coordinated by Paddington Arts and funded by the Heritage Lottery Fund. The Profiles of the Past initiative tells the story of British portrait silhouette art. The home page features a slideshow that overlays images of silhouettes through time, from 1775 to 1950. The Blog listing is a Drupal view displaying a list of aggregated content. The website also includes an alphabetised list of silhouette artists and sections about how silhouettes were made and how to identify them. The gallery of silhouette images is divided into two sections: a Curated Collection of 250 artefacts, each with metadata linked to the artist biography and to related artefacts; and a Open Collection of around 500 artefacts suppleied by collectors and the public. The website is based on a Drupal 7 open source content management system with some minor customisation. 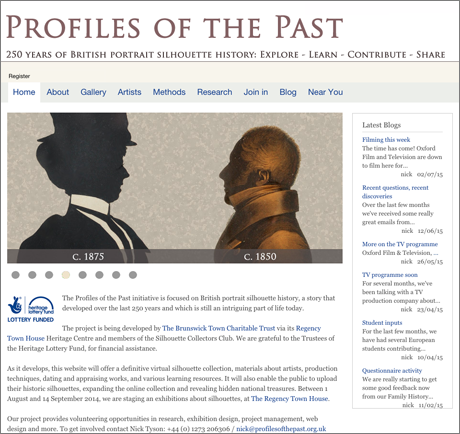 The Profiles of the Past website is a part of a project coordinated by The Regency Town House Heritage Centre and the Silhouette Collectors Club and funded by the Heritage Lottery Fund. MyHouseMyStreet is a collaborative, community-based project providing information about Brighton & Hove's historic homes and streets. The website contains more than 50,000 images of street directories and census returns relating to those who lived in Brighton & Hove in the past. It includes an interface that enables images of street directory pages to be classified and tagged by volunteers and also a database of census returns displayed in a tabulated interface that is searchable and sortable. These are complimented by pages of street histories researched, compiled and written by volunteers as a means to help local people to engage with the history of their neighbourhood. The website is based on a Drupal 6 content management system to provide the staff and volunteers with full control over the content. Zoomify is used to enlarge the images and enable them to be classified and tagged. An Apache Solr search engine provides a faceted search interface, where users can filter the data by: object type, tagging, publisher and date. The page layout is based on a 12-column grid, 960 pixels wide and employs two sidebars for navigation and secondary content. Home page content is fully editable; the three columns draw their content from editable source pages, while the Blog and Notices blocks are Drupal views displaying lists of aggregated content. The design was kept deliberately simple and easy to maintain by a largely volunteer team of editors. 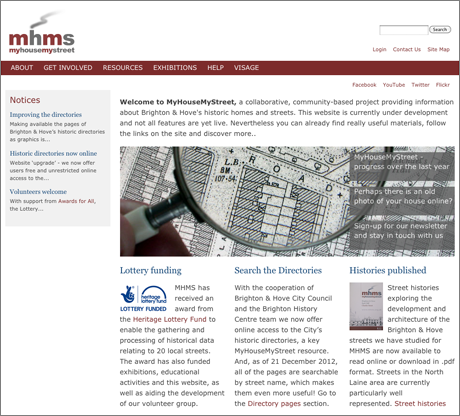 The MyHouseMyStreet website is a part of a project coordinated by The Regency Town House Heritage Centre and funded by the Heritage Lottery Fund. 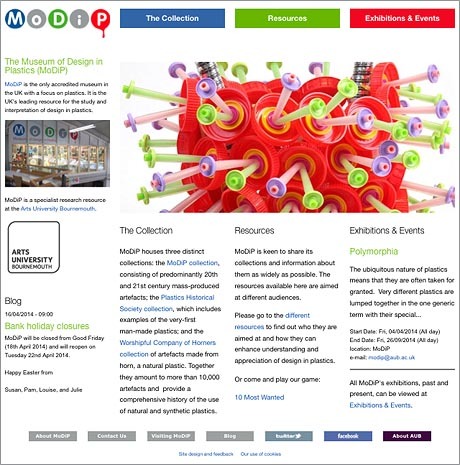 The only accredited museum in the UK with a focus on plastics, The Museum of Design in Plastics (MoDiP) is a leading resource for the study and interpretation of design in plastics and is a specialist research resource at the Arts University Bournemouth. The website contains more than 12,500 artefacts in its database and each artefact is defined within a linked three-level classification. The artefact metadata is also linked and can be searched and filtered using an Apache Solr search engine by: designer, manufacturer, materials, method of manufacture and colour. The home page features a slide show image that changes randomly with each visit and all the content on the home page is fully editable by museum staff. The site uses a Drupal 6 content management system to provide the curators with full control over the content. Using this they are able to make online exhibitions and add learning resources, case studies and guides to the manufacture and care of plastic artefacts. 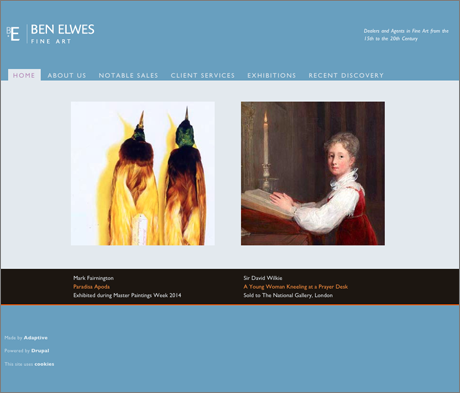 Ben Elwes Fine Art has an established reputation as a specialist dealer in the field of Old Master and British paintings. Originally made as a bespoke PHP site and later transferred to a Plone framework, this website had been through numerous incarnations. We ported it into a Drupal 7 framework and incorporated some of the colours and fonts used in Ben Elwes' print design materials. The website includes a Notable Sales gallery and lists client services and upcoming exhibitions. There is also a Recent Discovery page that tells the story of a painting by David Wilkie now in the National Gallery. The home page design features a pair of images that can be used to create visual tension or harmony and the client chooses. The selection and positioning of these images is controlled simply by reordering a list of artefacts in the content management system. This is a simple website based on the Drupal 7 open source content management system. 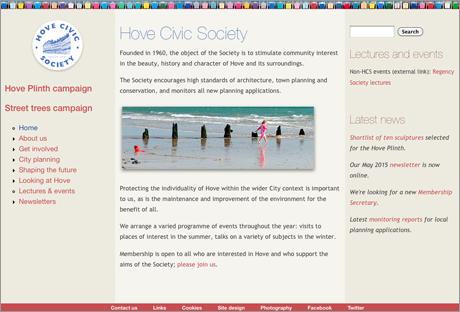 The website's styling reflects Hove’s seaside location, combining a narrow banner of beach hut images with sand and stone background colours and a panoramic image of a local scene. It features left and right sidebars and a central content area, all of which can easily be managed by the volunteers of the society. Any images used in the site are automatically given a drop-shadow in CSS to give is a slightly more 'glossy' feel. This is pro bono site work for a local amenity society whose members and aims we support. 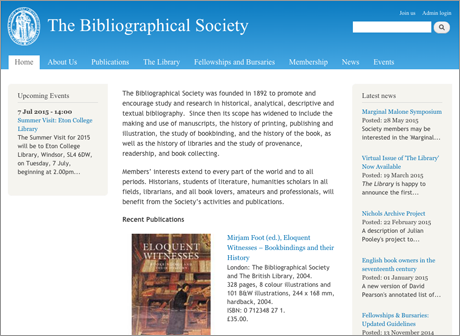 The Bibliographical Society was founded in 1892 to promote and encourage study and research in historical, analytical, descriptive and textual bibliography. Since then its scope has widened to include the making and use of manuscripts, the history of printing, publishing and illustration, the study of bookbinding, and the history of the book, as well as the history of libraries and the study of provenance, readership, and book collecting. The society needed a website they could manage for themselves, through which members can be kept up-to-date with news, events and publications, and student can find and download informnation about grants and bursaries. We made for them a simple Drupal 7 website using tabbed navigation, with Views of Upcoming Events and Latest News in the sidebars and an autoplay slideshow of recent publications on the home page. The site also features a 'fat footer' that expands the first and second level menu listings to enable users to overview the content for ease of use. The Art Libraries Society is the professional organisation for people involved in providing library and information services and documenting resources in the visual arts. 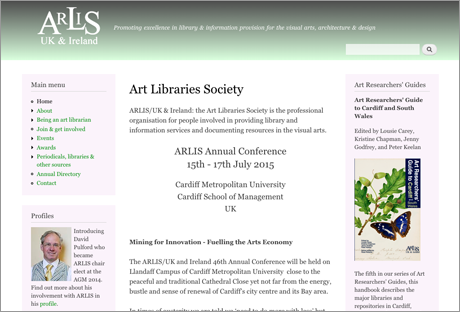 The website includes careers information and provides listings for events and news items for ArLiS members. It is also a portal for users trying to locate art, architecture and design publications and related materials and includes a database of periodical titles, plus a list of art libraries and links to other sources of information. The website is built on a Drupal 7 open source framework and its simple format is designed to be easy to maintain by its part-time administrators.